Less than 24 hours after President Donald Trump signed an executive order clamping down on refugee admissions and temporarily restricting travelers from seven predominantly Muslim countries, the impact was already resonating at airports around the world. The Trump administration had not yet issued guidance to airports and airlines on how to implement the executive order. "Nobody has any idea what is going on," a senior Homeland Security official told NBC News. 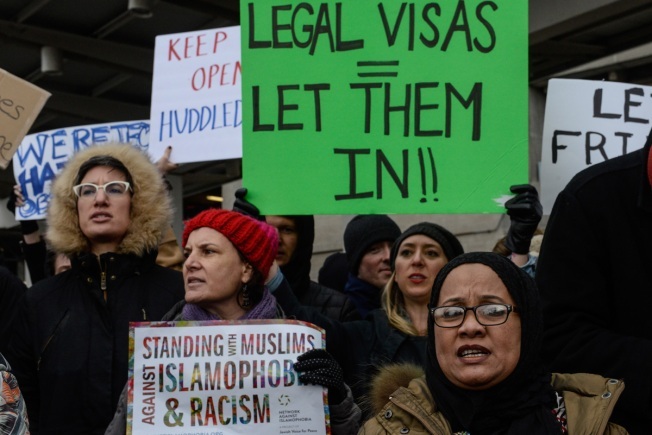 By Saturday night, a federal judge had issued an emergency order temporarily barring the U.S. from deporting people from nations subject to Trump's travel ban. Prior to the judge's ruling, demonstrators amassed at airports across the country in protest of the order. Hundreds gathered at John F. Kennedy Airport where 12 refugees were detained Saturday. Virginia Gov. Terry McAuliffe said that a family was detained at Dulles International Airport, where demonstrators were also gathering. Hillary Clinton took to Twitter to express her support for those who came out to protest. More than 1,000 people RSVP’d to a Facebook event for Saturday’s rally at O’Hare International Airport in Chicago, which was organized by several advocacy groups. The protest was planned for 6 p.m. CST in O’Hare’s International Terminal 5, though dozens arrived at the airport hours earlier, including several volunteer attorneys who gathered to assist travelers entangled in the ban. At Dallas-Fort Worth International Airport, a crowd of protesters grew into the hundreds as the night went on, and chants of "set them free" grew louder. West coast activists hosted a #MuslimBan protest Saturday afternoon at the international arrivals section of San Francisco International Airport. Protesters were carrying signs reading #NotInOurName, #NeverAgain and END the #MuslimBan, according to an event page. Holding up signs that read “Give me your tired and huddled masses yearning to breathe free,” “Protect Immigrants” and “Build a wall – We will tear it down,” demonstrators also gathered Saturday afternoon at San Diego International Airport. Protesters including Philadelphia Mayor Jim Kenney gathered at Philadelphia International Airport Saturday, with another protest set to take place at the airport Sunday afternoon. An attorney with the ACLU of Pennsylvania told NBC10 that three adults from Qatar were being detained there, and two Syrian families were briefly detained there Saturday before being sent back on a return flight to the Middle East. More than 120 people clutching signs denouncing the Trump immigration orders gathered at Newark Liberty International Airport. NorthJersey.com reported that they joined lawyers who'd rushed to the airport to defend the rights of refugees and immigrants who were being detained and denied entry. About 300 people expressed their displeasure with the ban at Los Angeles International Airport Saturday night. Protesters entered the airport's Tom Bradley International Terminal after holding a candlelight vigil. Demonstrators also took to the streets, rallying in cities like Boston, where protesters marched against policies organizers were calling "anti-immigrant and unconstitutional."